It is often held that toroidal inductors are 'self shielding' that there is negligible external magnetic flux. 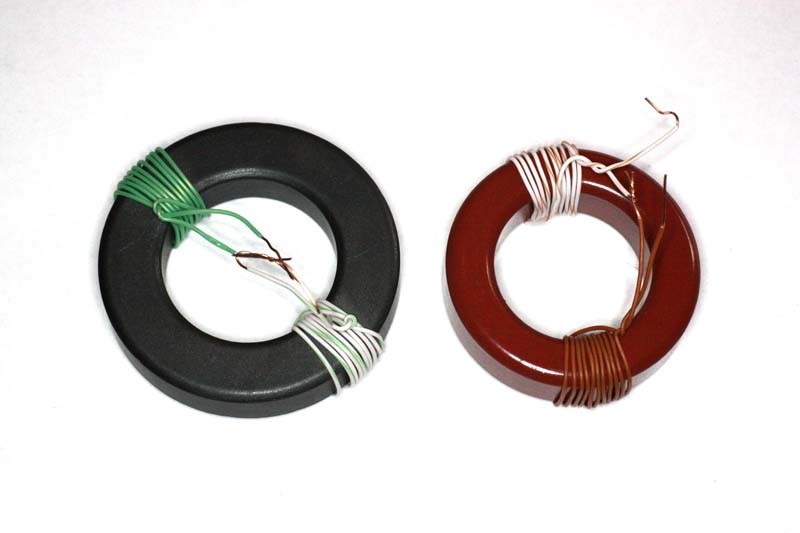 Coupling between inductors can be minimized by using separate closed magnetic cores for each. Since an inductor’s magnetic field is contained almost entirely in a closed core, two inductors with separate closed cores, such as the toroidal inductor in Fig 2.46 C, can be placed close together in almost any relative orientation without coupling. The way in which this would happen is that the reluctance of the magnetic path in the core is so low that almost all of the flux due to the magnetising force of the current is contained within the core. This would also imply that there must be near 100% flux coupling between turns anywhere around the toroid. That depends on the dimensions of the toroid, and the reluctance of the core path. It is somewhat simpler to make some measurements than to predict mathematically the behaviour of some structures. the red one on the right is a low permeability powered iron core (µi=10) T2-200. Both cores were wound with a pair of close wound 10 turn coils on opposite sides of the toroid, and the inductance measured at 1kHz with the coils series aiding and series opposing. From the measurements, the flux coupling factor k can be calculated, k=(La/Lo-1)/La/Lo+1) where La is the inductance aiding, and Lo is the inductance opposing. Table 1 above shows the measured inductances and calculated flux coupling factor between the two coils on each toroid. So we can say that in the case of the FT240-43, most of the flux (91%) that cuts the coil creating flux cuts the coil on the opposite side of the toroid, and therefore, less then 10% 'leaks' into the space outside the toroid, so there is a little external flux. Nevertheless, one might regard this shows significant self shielding property, although not perfect. The T200-2 'leaks' most (93%) of the flux produced into the space outside the toroid, and much of it will be into the surround space where it can couple with other conductors. This is hardly 'self shielding'. Cores of permeability from 4 up to thousands are used at radio frequencies, but most commonly from 10 through to 2000, and within this range some are effectively self shielding and some will have most of their flux external to the core. The proposition that coils on toroidal cores are self shielding in general is a myth, though it may be approximately true for medium to high permeability cores.